The European Union is surrounded by 78000 km of borders, a number that should doubled if we take account of the internal borders’ expanse of Member States. Since the mid eighties, the states of the European Union have been increasingly reinforcing migration controls not only on their borders but also in countries of migration’s origin and transit areas for migrants. That change makes migration roads more dangerous and obliged the poorest to stay in their situation. 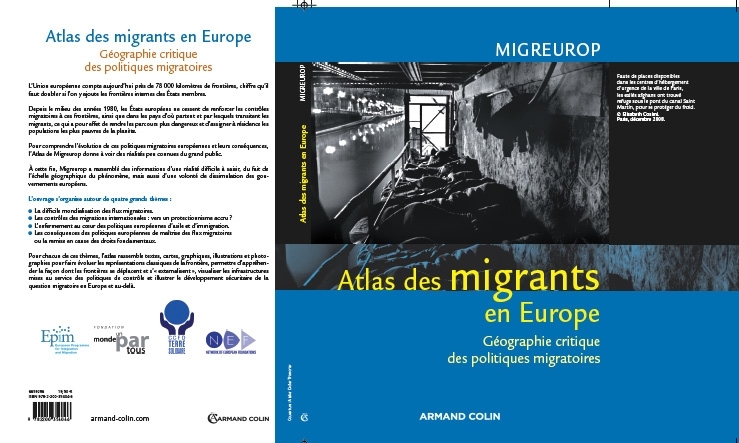 To understand these migration policies’ evolution and consequences, this critical atlas offers us a qualified view on the subject, by presenting some realities usually misunderstood from people in large. Following that purpose, Migreurop gathered information about a reality not only hard to comprehend because of the wide geographical scale it deals with, but also allusive since European Governments try to conceal it. Each subject explored (about thirty : European visa policy, transit camps, family entry and settlement etc...) is presented in a didactic and illustrated three-pages report in which photos and figures complete geographical maps. 36 Migration, globalisation, and transnationalism : which ability to act for the most vulnerable ?